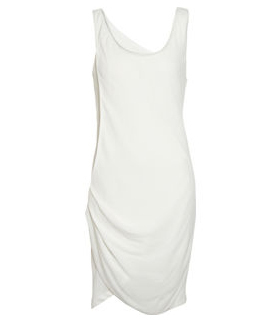 In case you weren't convinced by the knit tank/asymmetrical skirt combo, how bout this crepe twist tank dress? Tried this beauty on the other day....still deciding. I'll let you know if I get married in it! verdict=frumpy. i AM however sticking to that headband i swore i'd order months ago, with the dog the bounty hunter esque strand of white feathers? it's sweet.